Paperback, Flexi-cover, 160 pages, 10.0 x 15.5 cm, 3.9 x 6.1 in. Running is the harmonisation of meditation and sport. Flow is the harmonisation of humans and activity. Both together create an euphoric being, a relaxed high performance, and an ecstatic sense of self-forgetting. For the first time, Dr. med. 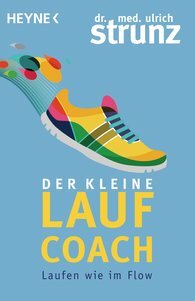 Ulrich Strunz brings together scientific findings, helpful nutrition tips, and personal stories from his decades of experience as a physician and runner, illuminating the healthy effects of running and explaining how we can finally vitalise and activate our deeply rooted need to run.